“On Deadly Ground” is a grand tale of the many loves of Steven Seagal: explosions, tasseled clothing, wanton murder, the environment, fighting bears, and bad film-making. It is almost like a visual scrapbook that allows one to peer into the mind of a man who some have referred to as an “actor”. If you cut 45 minutes out of “On Deadly Ground”, you could have an amazingly entertaining (yet horrible) 50 minute TV movie. Unfortunately, this movie is filled with massive lulls in the action where little-to-nothing happens. You are presented with all of the lovely scenery Alaska has to offer, but that sort of spectacle starts to get old after a few minutes without any plot momentum. 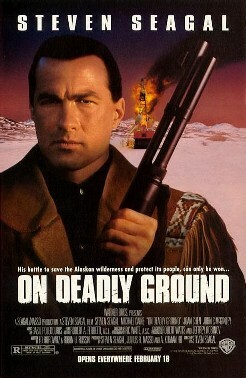 As with many bad movies, the lack of cinematic pacing is the #1 problem with “On Deadly Ground”, but it is far from the only major flaw with the movie. I will say that it becomes mildly more watchable (and significantly more hilarious) if you watch through all of the dragging scenes at 1.5x speed. Next on the laundry list of problems with this movie: the acting and directing (read: Steven Seagal). 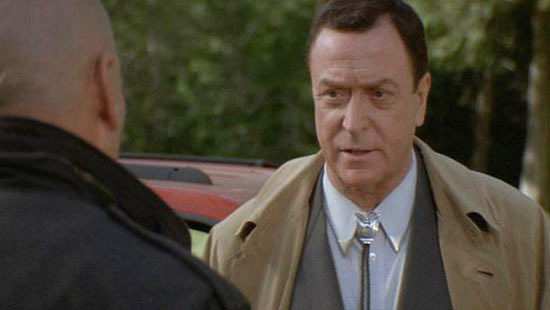 All of the villain characters in “On Deadly Ground” at least do an excellent job of hamming it up and making their screen time count, including notables such as Michael Caine, R. Lee Ermey, and John C. McGinley. However, unfortunately, most of the screen time in this movie is devoted to the never-charismatic, gargantuan wood block that is Steven Seagal. The fact of the matter is that Seagal just cannot act, and his presence never improves a film. In the unfortunate case of “On Deadly Ground”, he is not only the lead of the film, but he was also given the directorial reigns of the movie (for reasons that I will never comprehend). Apparently this decision led to some rather questionable calls on Seagal’s part, which significantly inflated the budget. My guess is that he needed more dramatic explosions, tasseled clothing, and oil for Michael Caine’s hair than initially projected. This movie being Seagal’s directorial debut almost certainly explains the aforementioned poor pacing as well, a not-uncommon issue for first-time directors. If you have heard anything about “On Deadly Ground”, you have heard about its heavy-handed environmental message and plot. 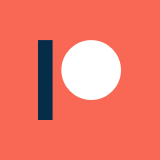 The plot centers around Michael Caine’s character, an oil baron, and his plan to deny land right to a native tribe through the construction of a massive oil refinery-thing. Steven Seagal, whose character is a member of a local tribe, is introduced to the audience as a high-level employee in Caine’s company, who specializes in resolving oil disasters and other such shenanigans. Seagal turns on Caine and ultimately destroys the refinery for the good of the local peoples, but not before murdering and exploding a significant number of people. In most movies, the credits start rolling after the resolution of the plot. In “On Deadly Ground”, however, the movie doesn’t end until after a significant, rambling lecture on environmentalism delivered by Steven Seagal over a montage of stock footage. 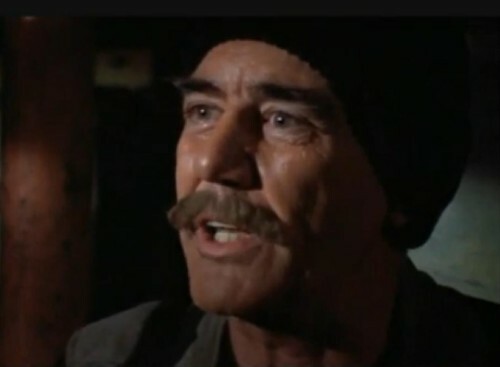 It isn’t an epilogue so much as it is a debriefing of the film’s message: just in case you didn’t get that oil companies are bad from Michael Caine’s cartoonishly evil performance. This message isn’t heavy-handed: it is lead-fisted. Also, there is a brilliant environmental commercial in the movie, featuring what is sure to be Michael Caine’s career low-point. Fun fact: there is a cameo in there from famed director Irvin Kershner. That has to be one of the least fun ‘fun facts’ in history. There you go! 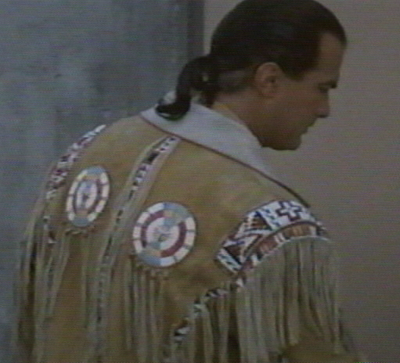 That’s pretty much all you need to see from “On Deadly Ground”. Don’t forget to recycle.